This year is going to be a fun year. 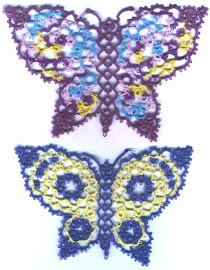 I've received the most wonderful invitation to teach a tatting pattern at a workshop in Japan. I've never been to Japan and I'm very excited about it all. (nervous too) If anyone has any tips on traveling there, please let me know. When I get closer to having the instructions complete I will post a picture of the penny purse I'm teaching. Creating a new website on Google has been a challenge. As I reconstruct it, if anyone has suggestions of what you'd like to see about tatting shuttles, just let me know. I look forward to seeing you in Spokane again this year. Japan will be exciting! It is a very friendly place to visit. Mimi D can also give you some advice as she has spent some time there too! ....have you seen my new precious metal shuttles? Woo hoo, my first comment. OMG I'm such a newbie to this whole blogging thing. I really love what I've seen so far though. It will be nice to see you again too. I did see your new shuttles! I really love the color of the copper ones. Hope I get to see one in Spokane. I would love to see pictures of different tatting shuttles. I just wish I still had the Tatsy I had when my oldest daughter was little - she used to teeth on it! Alas, it got lost in all the moves. I look forward to seeing your blog blossom!